by Jay Fiorello • There’s no question that workplace productivity and wellness can suffer as a result of vision problems; yet many employers remain undereducated on the benefits of offering vision coverage to their employees. by Fred Gosman, CPA/CFF • Our firm sees many claims that are denied or delayed because of incomplete medical documentation or a lack of evidence tying the medical condition to the claimed disability. by Doug Waters • Recent medical, dental, and law school graduates typically have less disposable income than their more established peers. This can make a successful IDI sale. by Dru Coleman • Brokers looking to supplement their revenue streams often tell me they are all ears for new opportunities. This may be a pun but it is recognition that demand for newer, voluntary offerings, such as hearing and long-term care, is far higher than the rate at which they are currently offered. by James Bramson, D.D.S. • The results are in: oral wellness can help employers and their employees save money. As a dentist, I’ve known for a long time that the health of your mouth can affect the health of your body; a lot of research clearly shows this. Is Your Employees’ Legal Health a Major Issue? by Robert L. Heston, Jr. • Given the high cost of health care support needed by employees who face unexpected legal problems, HR professionals and companies of all sizes should be convinced that this area of concern is clearly a health issue. by Marcia L. Bowers • When it comes to today’s diverse workforce, an employer must consider the needs of all its employees — from Baby Boomers to Generation Y. One way employers are addressing their needs is by leveraging voluntary benefits to create a universally appealing employee benefit package. by Mark Roberts • Dental care has become more popular as a voluntary employee benefit. Employers are finding that offering it on a voluntary basis allows them to retain this prized benefit in the face of rising costs and shrinking budgets. by Stacy Maloy • Clearly, hospital indemnity insurance is a needed and valuable product that gives employees an easy and affordable way to protect both their family and their finances. by John Wane • LTC insurance has been experiencing an uptick in sales during the past couple years. This comes as employers are beefing up their buffet of benefit options to fill coverage gaps and maintain a benefit package that effectively attracts and retains talented employees. by Rajiv Kumar, MD • Changing behavior and adopting healthy habits can seem incredibly daunting. It takes plenty of hard work, but there’s no reason we can’t lighten the load on the journey toward healthy living by adding some fun and games. by Rich Lane • Brokers can develop a secure and long-term client base by developing a thorough understanding of the big picture of the annuities market — the sales process, what a purchaser is looking for and the carrier’s integrity. by Leila Morris • Los Angeles Health Underwriters (LAAHU) held its annual University Day in Los Angeles at the end of April. In past years, some feared that the Covered California exchange would make insurance agents obsolete. There was also the fear that carriers would struggle to meet the challenge of restructuring the entire health insurance industry. .
by Scott Gabehart • Business owners are an attractive market for life insurance professionals. They provide many opportunities for insurance sales and the premiums can be significant. 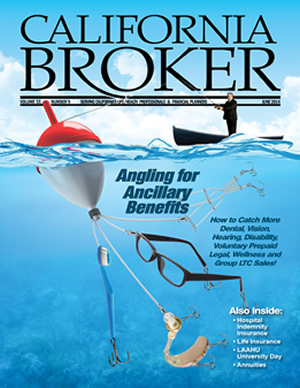 Angling for Ancillary Benefits – How to Catch More Dental, Vision, Hearing, Disability and Group LTC Sales! For our June issue, we’ve assembled a series of articles on ancillary beneﬁts. We think the more agents discover the advantages of products including dental, vision, disability, group LTC, hearing and prepaid legal plans, the more they’ll see these products as a way to rise to the top in today’s market. My perception of vision benefits did not reflect trends in vision care and product development. Some -really compelling information about the implications of vision on the workforce was beginning to penetrate our world. Today, all-inclusive provisions aren’t considered to be as strong as having an actual vision benefit that provides regular access to a true exam by an eye doctor and coverage of premium vision wear products that can dramatically improve eyesight. In 2013, I was invited to attend Transitions Academy where I learned about the ways lifestyle conditions can affect eye health — from smoking to sleep. I also gained a newfound appreciation of the importance of vision care, not only for employees’ eyesight, but also for their health and productivity. For me, the pieces of the puzzle that connected vision with medical fell into place and revealed a much different picture. I was anxious to catapult what I learned into a more complete, well-rounded coverage recommendation for my clients and their employees. The next challenge was to convey the role of vision as more than a dollar-for-dollar (or less than) program with the benefit of being able to budget through tax deferred payroll deductions. As brokers, we need to help employers see the greater connection, and encourage them to communicate it to their employees. I understood the process that was necessary for making this change in attitude, since, not long ago, I also had a shortsighted view of the role of vision benefits. So, I immediately put my plan into action to open my clients’ eyes to the broader possibilities vision has to offer. How disease detection affects vision health and overall health can’t be overemphasized when it comes to capturing the attention of employers and employees. During presentations, I position eye exams as a minimally invasive way of seeing into the human body, yet one that provides vital information. Employers don’t often realize that an eye exam can uncover diabetes as well a number of other chronic conditions like hypertension and neurological disorders. Regular exams can also help detect eye diseases earlier — sometimes even before symptoms become noticeable. Early detection, which is a key component of treatment, can reduce medical costs down the road. A consideration for any employer’s wellness program should be a comprehensive vision benefit that covers regular eye exams from a qualified eye-care professional. The more times employees are seen by a health professional, the more likely that any potential issues will be diagnosed. Eye health, dental health, and medical care are all related, and none can be addressed as completely without integrated patient information and treatment plans. Finding an insurance carrier that offers all of these in one place helps employers better manage detection and disease management within their workforce. I explain to my clients that, because I work with a plan that covers all of these areas, their employees get access to clinical coordination, which means that medical doctors and eye-care professionals can share data. As technology advances, it’s becoming even easier to bring these areas together to offer the best possible outcomes for patients. It’s important for employers to know that employees value their vision benefits. In general, employees perceive a vision benefit to be a positive value that leads to immediate rewards. Employees want to know that their benefits provide the best value. Illustrating the potential savings through superior doctor networks, as well as best-in-class arrangements with retail and wholesale vision product suppliers, makes a better argument than simply listing the covered reimbursement. Benefit coverage has moved to the forefront of employees’ minds, especially since the introduction of healthcare reform. As employees become more informed consumers, plans that offer choices are becoming increasingly popular. In this environment, it’s not only a wise decision for employers to provide vision benefits due to the implications on health, but it’s also becoming almost a prerequisite with any voluntary offering. I position the vision value to -employers right on the heels of talking about the role of a medical benefit in employee satisfaction and retention. Employers can build employee loyalty by simply offering a program that offers a positive value, and one that reaps immediate rewards, such as new glasses. One of the most interesting aspects vision benefits for me to learn about is how it relates to employee performance. Offering a vision benefit can actually help increase employee productivity. Having poor vision, whether from an eye disease or a lack of proper vision correction, can lead to injuries on the job, tired eyes, headaches, etc. It can also cause workers to be absent from work more frequently or, even when present in the office, they may work less efficiently. Part of the game plan is to educate employers on the significance of a vision benefit in diagnosing potential problems as well as the value of materials coverage. Any diagnosis made during the exam quickly loses its value if employees can’t afford vision wear that they find attractive, comfortable, and capable of meeting their visual needs. As employees continue to take charge of their healthcare and seek to understand the finer points of coverage, they’ll often ask whether products they’ve seen advertised are covered. Eyewear discounts, selection, and premium options are key areas that I focus on when meeting with leadership and detailing the benefits of vision coverage. I started with two of the boards of education that I represent, illustrating the benefits to employers and employees, with an even more personal direction of care for children. Messages about the necessity of eyesight for children’s growth and well-being resonated with these educators. A large number of employees and decision makers for these districts have children of their own, many of whom wear eyeglasses. One plan provides a Transitions lens benefit with a $0 co-pay for children 19 and under, which is a huge selling feature for parents. As eyeglass wearers themselves, the board members are familiar with the out-of-pocket cost associated with premium lens upgrades, and they appreciated a more robust plan that included the latest in technology and product offering. Both of these groups (with 500 and 700 lives) signed on for the vision plan we presented, using this plan of action. There’s no question that workplace productivity and wellness can suffer as a result of vision problems; yet many employers remain undereducated on the benefits of offering vision coverage to their employees. A stronger emphasis on vision by plan reps and benefit brokers can help HR professionals understand the critical importance of offering employees access to comprehensive eye exams and eyewear to help them see their best. Jay Fiorello is a consultant for Ovation Benefits, A Digital Insurance Co., in Conn., which provides health improvement benefits, incentives, interventions and member support to employer groups of all sizes. He was a finalist for the 2013 Transitions Vision Benefits Broker of the Year award. One of the biggest issues that clients face when filing a disability claim is the lack of clear medical opinions explicitly linking their condition to their disabling restrictions and limitations. Physicians are skilled at diagnosing an injury, disease or illness, but they may not be the best at explaining why the condition is disabling for a claimant. This can especially be problematic for clients suffering from mental illnesses or other types of “invisible” disabilities. These ambiguities may cause increased scrutiny by claims departments and are often used as a basis for disability claim denials. Helping your client connect the dots between their condition and their inability to work simplifies the disability claims process and fosters a quicker claim review with fewer questions. There are two different aspects in helping connect a diagnosis to a disability: claimants themselves and physicians treating claimants for their medical conditions. Each of these will affect the viability of a disability claim along with the challenges that clients face to get their disability benefits. Making sure that these aspects of a claim are clear and strong is a great way to help clients with the disability claim process and help the insurance company see a clear and fair picture of the issues your client is suffering. There are two halves of diagnoses that make up the whole picture for the insurance company. The claims examiner wants to see evidence of the medical condition and proof that the condition is, in fact, disabling, and preferably, although they don’t use the phrase much anymore, they want to see “objective medical evidence.” While it is common to use generally accepted protocols to make a fact-based diagnosis, proving to a reasonable standard that the condition is disabling is much more difficult, especially when looking at the claim through the eyes of a claims examiner. Claims departments also hire medical consultants who take another, if sometimes a company-leaning, perspective of the evidence and documentation of the disability. This is especially true for claims of people who are suffering from disabilities that you can’t physically observe. The lack of objective and measurable testing for many such conditions leaves much to the interpretation of the claim professionals who are reviewing the claim for the insurance company, allowing them to decide for themselves what evidence is important and what documentation can be disregarded. The first step in proving a disability resulting from a subjective diagnosis depends on the condition itself. Clients, such as physicians, who treat mental illnesses and invisible disabilities, are already comfortable dealing with somewhat ambiguous issues and concerns. Other types of clients need to be aware of additional tests or specialists who may be needed to provide evidence of their disability that a primary care physician may not pursue. For example, if a client is being treated for arthritis by their primary care physician, it’s a good idea to include care and treatment by a rheumatologist who can reinforce the opinion of the primary care physician and provide more robust testing and diagnosis. Beyond the testing and diagnosis, the notes and comments recorded by an attending physician are extremely important to provide convincing evidence, not just for the condition, but also for the disability. Many patients can be encouraged to help with some of the record-keeping burden to produce medical records that are appropriate and supportive in the disability claim process. Clients should be encouraged to prepare information to quickly, clearly, and completely communicate the relationships between their symptoms and their job duties to their doctor. Doctors need to understand that their notes must draw a clear cause-and-effect linkage between the test results and clinical observations to the restrictions and limitations placed on the patient from performing their job duties. It’s also important to make sure that any of the doctor’s off-hand comments or notes are clarified and put into context so they can’t be misconstrued by the claims department. The decisions your client makes in choosing their treating medical professionals can help or hurt their disability claim more than any other single factor. Not arranging to get appropriate care and treatment for their conditions or choosing a physician who’s not understanding in helping with the disability claims process can create roadblocks for any disability claim, so it’s in the client’s interest to take the time and effort to choose appropriate medical professionals and to help them understand and prove the disability claim. There are several steps clients can take to help their attending physicians. Client must first be completely honest with their attending physicians. Clients should prepare a detailed and thorough list of their restrictions and limitations; make sure not to leave out or exaggerate any symptoms. Most doctors are understanding of their patient’s circumstances, so there’s no reason to stretch or try to be creative to get a certain finding. Certain tests can be administered discretely to see if patients are making good faith -efforts, and clients may lose the support of the doctors who would have otherwise been supportive of their claim. Once suitable physicians have been chosen, allow them the ability to provide a proper diagnosis and generate records that are supportive, complete, and accurate, even if the insurance company pushes back against them. For example, if your client is suffering from conditions, such as fibromyalgia or chronic fatigue syndrome, ask your client to be more descriptive and specific when describing pain instead of using general phrases, such as “all over” or “all of the time.” These statements don’t necessarily help the doctor with a diagnosis and can be exploited by claims examiners. It’s also a great idea to go over each claim form the doctor must complete and submit on your client’s behalf. Like mentioned above, doctors are very good at examining symptoms and diagnosing conditions, but they aren’t necessarily trained in connecting these facts to a disability. Make sure that they really understand the extent that the medical condition has disabled your client from their day-to-day activities and that all of the information recorded in the doctor’s notes is reported on the claim forms. Physicians are very busy, and filling out claim forms is not high on their list of preferred activities. Incomplete and incorrect claim forms, which are all too common in our line of work, won’t be excused in the claim adjudication process. Clients can get treatment from any medical professionals, but they should make sure to include one who is considered a specialist who is trained and experienced in diagnosing and treating the condition. While many doctors are capable of treating and diagnosing wide varieties of conditions, specialists may have knowledge of and access to additional testing not commonly available as well as a more in-depth knowledge of the condition. For example, a client who is suffering from depression may consult with an entire team – psychologist, psychiatrist, neuro-psychologist, sometimes even a sleep doctor. While there are basic steps to prove this condition, some specialists can test and provide additional supporting evidence of how the disability affects your client. This can produce better support for a claim that’s difficult for the claims examiner to impeach or ignore. It also prevents the insurance company from asserting that your client was failing to receive appropriate care and treatment. Fred Gosman is a disability claims consultant with the firm Royal Claims Advocates. Royal Claims Advocates specializes in helping people through all parts of the disability claims process. Fred can be reached at 855-828-4100 or through e-mail at Fred@RoyalClaimsAdvocates.com. For more information, visit www.DIClaim.com. Newly minted doctors, dentists and lawyers are beginning their careers on an optimistic high. However, their excitement over new careers combined with a mindset of youthful invincibility could translate into a problem if not addressed. This audience is a prime target for the discussion on the importance of income protection. So what’s the trick for brokers in engaging this audience? Bring your younger clients back down to earth without crushing their positivity. Millennials are a profitable niche market, especially when it comes to selling individual disability income (IDI) insurance. Connecting with these professionals when they are young can bring you customers for life. The term “millennial” is typically associated with the generation born after 1981. They are the best-educated group of young adults in United States history. Social media and the Internet are a daily part of this tech-savvy generation’s life. They use these channels to connect with, and better understand, the world around them. While technology comes easily to them, the soft economy has, depending on the industry, made jobs hard to come by. Millennials are the first generation to have higher levels of student loan debt, poverty, and unemployment than the two generations before them at the same life stage. They also have lower levels of wealth and personal income. Many recent graduates are feeling the pinch of student loan debt. Medical, dental, and law school graduates are even more aware of it even though their starting salaries might be higher than other professions. • The average debt of a public medical school student graduating in 2013 was $162,736. Of these grads, 35% also had prior education debt and 23% had non-education debts. • A lawyer’s average yearly salary is $131,990, a dentist’s average is $164,570 and the average wage of a physician or surgeon is $187,200. It can take time for new graduates to earn these salaries, meaning the educational debt they incur is that much more painful. Their salaries may be higher than those of their peers. Yet young doctors, dentists, and lawyers are still vulnerable to the risks that disability and life insurance protect against. • Make word of mouth work in your favor. It might sound like a low-tech way to reach this connected generation. But, according to a LIMRA study, 51% of Millennials cited their parents as most influential when purchasing an insurance product. Current customers singing your praises might be your connection to a rising star in the medical, dental or legal profession. • Amplify with technology. LIMRA data also showed that the Internet is also one of the top-influencers for Millennials when choosing an insurance product, as 39% used it to conduct research. Meet their demand for instant access with a robust online presence. Millennials can be vocal, so encourage your clients to like your Facebook page, or retweet your latest update. Let them lead new clients to you. • Meet them on their turf. There’s no easier way to reach your audience than to go to them. Graduate-school functions are great places to connect with future doctors, dentists and lawyers. Join a young professional networking organization. Face-to-face communication can help you stand out in a crowded digital world. • Eliminate distractions. Busy careers and debt worries can be major roadblocks to helping Millennial clients focus on preparing for the future and the need for added income protection. Overcome this distraction by identifying their debt worry as one of the reasons why they need income for living expenses should they suffer a disabling injury or illness. Highlight the potential for lost income and identify how IDI can provide this protection. This tactic can be effective with young doctors, dentists, and lawyers who are often burdened with debt. • Stress the “I” in Individual. Young professionals covered only by an employer’s group disability plan often have large gaps in income protection. There are many reasons for this, including the policy’s maximum monthly benefit or the definition of earnings. Stress to your clients that any group plan, no matter how strong, won’t follow them from employer to employer. The ability to lock in portable income protection will resonate with this mobile generation. • Emphasize flexible security. Speaking of portable income protection, remind clients that, if they choose to leave an employer with their policy, the premium and own-occupation definitions remain intact, along with the class level at which the policy was originally written. Features in premium IDI policies – including partial disability and residual disability riders – are important for this audience and provide additional income protection if a person can’t return to work after suffering a disabling illness or injury. Future purchase option riders also guarantee a client’s right to purchase additional amounts of IDI as his or her income grows. The good news is they don’t have to provide medical evidence of insurability. Recent medical, dental, and law school graduates typically have less disposable income than their more established peers. This can make a successful IDI sale to this audience a challenge. But putting in the hard work to get their attention can pay off. Helping them make critical IDI buying decisions positions you as a trusted advisor. 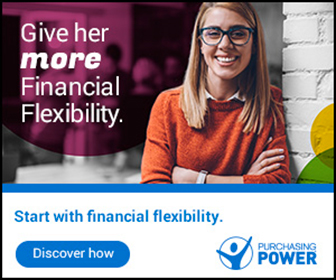 It also helps them protect their ability to earn income in their specialized professions, and can turn them into lifetime clients that will look to you for their future financial needs. Doug Waters, CLU, RHU, REBC, is the second vice president of individual disability income insurance (IDI) sales at The Standard. In this role, he leads The Standard’s IDI sales organization and represents the needs of the field to the home office. Doug has more than 25 years of insurance industry experience, including stints as a multi-lines sales agent, worksite marketing agent, group wholesale manager and several home office executive roles, most recently in IDI sales and distribution leadership. He can be reached at 513-759-0124 or at doug.waters@standard.com. The Standard is a leading provider of financial products and services, including group and individual disability insurance, group life and accidental death and dismemberment insurance, group dental and vision insurance, absence management services, retirement plans products and services, individual annuities and investment advice. For more information, visit www.standard.com. Brokers who are looking to supplement their revenue streams often tell me that they are all ears for new opportunities with voluntary benefits. This may be a pun aimed at my hearing insurance background, but it is also recognition that – unlike more established benefits – the demand for newer voluntary offerings, such as hearing and long-term care, is far higher than the rate at which they are offered. Mainstream benefits are being offered at a rate exceeding interest. But more than twice as many employees say they would be interested in enrolling in newer specialty care benefits, according to a recent survey of more than 1,500 full-time employees by EPIC Hearing Healthcare. This provides an important new opportunity for brokers to boost their revenue and increase client satisfaction by helping them understand and meet a clearly unmet need. Employees are being offered mainstream benefits at significantly higher rates than newer specialty care benefits. Not surprisingly, medical topped the list of benefits being offered at 73%, followed by dental (66%), -vision (57%), and 401K (56%). Fewer employees are offered newer specialty care benefits, including long-term care (25%), hearing (15%), legal (13%), cancer (11%) benefits, and pet insurance (8%). While demand is higher for traditional benefits, it is mostly in-line with or even less than the percentage of employees being offered these benefits. The demand for newer specialty benefits demonstrates significant gaps (see Table 1). For example, while 45% of employees would be interested in long-term care, only 25% are offered it, a gap of 20%. While 31% of employees would want hearing insurance, only 15% are offered it, a gap of 16%. Part of the reason for these gaps is that the benefits are newer, so the saturation is not as high. Traditional benefit packages are increasingly important to employees as they think about their long-term financial security and realize that their mainstream benefits don’t adequately cover certain aspects of health care, such as hearing loss treatment or long-term care. Brokers have the opportunity to bring highly valued new voluntary benefits to their clients to fill these gaps and meet the demand. The demand for specialty care benefits is likely to increase as the 80 million Baby Boomers continue to see the effects of aging. More than three quarters of the employees say they expect hearing insurance to become more important as they age. We’re finding that many employees are recognizing the need to insure against financial exposure. However, many still do not understand the financial risks of their future health care. Twenty-eight percent of those who have not purchased long-term term care insurance believe that Medicare will cover their long-term needs, and another 22% do not know who would pay, according to a survey by America’s Health Insurance Plans. Many employees are also misinformed about the coverage of hearing aids, which is the most common treatment accommodation for hearing loss. According to EPIC’s survey, 28% of employees are under the false impression that these products are covered under most medical plans, and 42% don’t know whether these products are covered. When approaching retirement, most people focus on ensuring that they have enough savings to sustain their standard of living. But they often fail to consider how to manage health care costs. The average price of a digital hearing aid is about $1,500, but can be as high as $3,000 to $5,000, according to the National Institutes of Health. The lack of understanding about what is covered or not covered by other benefits reveals an opportunity for brokers to educate employees on the need for voluntary benefits, such as long-term care and hearing insurance. Hearing loss is one of the most common conditions affecting adults, and it appears to be increasing at alarming rates. The most quoted source on the prevalence of hearing loss in the U.S. is a survey supported by the Better Hearing Institute. In the most recent survey conducted six years ago, 34.5 million Americans — or 11.3% of the population — reported a hearing difficulty. This was an increase of 8.8% over the prior survey in 2004. This increase demonstrates that hearing loss is a growing problem since it does not simply reflect population growth. The increase in U.S. households over the same period was only 4.5%. Not only is hearing loss on the rise, but it is also increasing across age groups, which is counter to common perception that hearing loss is restricted to the elderly. Sixty-five percent of people with hearing loss are younger than 65, according to the Better Hearing Institute. Due to its large size, the Baby Boomer population accounts for the highest number of hearing loss cases of any age group. One in six Baby Boomers has a hearing problem. However, hearing loss is also an important concern for younger workers, considering that 7.4% of generation Xers (ages 29 to 40) already have at least some hearing loss. Twelve percent of full-time employees are seeking treatment for a diagnosed hearing problem and — more alarmingly — another 30% suspect that they have a hearing problem, but have not sought treatment, according to EPIC’s survey. Ninety-five percent of employees with untreated hearing loss say it affects them on the job. The most common complaint is having to ask people to repeat what they said (61%), followed by straining to understand a conversation when there is background noise or other people are talking at the same time (57%). Additionally, 42% often misunderstand what is being said; 40% sometimes pretend to hear when they cannot; and 37% have trouble hearing over the phone. Strain from untreated hearing loss can not only hurt an employee’s productivity due to communication problems, but it can also take a toll on the employee’s health and well-being by causing excessive anxiety and stress, even contributing to depression. This is unfortunate, since today’s hearing aids have advanced so significantly that people with mild to moderate, and even severe, hearing loss can function as well as the general population. The study reveals classic barriers for employees who are seeking care, including stigma and financial concerns. Nearly half of employees say they would be concerned about their employer suspecting or knowing they had hearing loss. Add onto this the shock of the high cost of hearing aids, especially when most employees realize that their medical plans do not cover these costs. When presented with the facts, employers and employees agree that there is little question about the importance of healthy hearing to promote health and well-being. Most view it as integral to their job performance as well. Employers can make a difference by demonstrating their understanding and support and providing the tools and encouragement to help employees get the care they need. Supplemental hearing health insurance can provide access to a strong network of hearing professionals for yearly checkups, as well as substantial savings on hearing aids from major manufacturers for a very reasonable cost of $.35 to $1.75 per member. As the need for long-term care and hearing health care continues to increase, forward-thinking brokers can provide benefit packages that offer comprehensive coverage and education to help employees minimize risk. Brokers and employers can also integrate education on the importance of hearing health care into existing health education efforts. Content for education, including videos, story copy and more, is available free of charge through the Listen Hear! initiative at EPICHearing.com/ListenHear. If employees are offered health savings accounts (HSAs) or flexible savings accounts (FSAs), brokers can also explain to employers and employees that hearing aids are eligible expenses. Using hearing aids as an example of an eligible expense during open enrollment presentations helps bring further attention to this type of financial assistance. It has also been reported that the cost and complexity of long-term care insurance, and the inconsistencies of regulations across states have adversely affected the demand. Brokers are integral for understanding and navigating these offerings. The bottom line is that as brokers serve to guide employers and employees through their health care options, voluntary benefits, such as long-term and hearing health care, should be a priority, benefiting clients while provide an important revenue opportunity for brokers. Dru Coleman is the national sales and marketing manager at EPIC Hearing Healthcare. She received her B.S. from Cal Poly Pomona and later earned her Life & Health insurance producer’s license from the state of California. She joined EPIC in 2006, serving as the national accounts manager, until her recent transition to her current position with EPIC. Coleman also serves as the program manager for the non-profit, AUDIENT an Alliance for Accessible Hearing Care which serves low income individuals through partnerships with state Departments of Health & Human Services and Vocational Rehabilitation. She can be contacted at dcoleman@epichearing.com. The results are in: oral wellness can help employers and their -employees save money. As a dentist, I’ve known for a long time that the health of your mouth can affect the health of your body; a lot of research clearly shows this. But as a chief dental officer, I know that taking care of your mouth can significantly reduce health care costs, and I’ve got the research to prove it. A new study released in March by United Concordia Dental continues to show that significant medical cost savings and reduced hospitalizations are possible when people with certain medical diseases or conditions, such as heart disease, stroke, or pregnancy, treat their gum disease. Specifically, periodontal treatment was associated with statistically significant decreases in annual medical costs of 40.2%, or $2,840 per year in patients with diabetes; 40.9%, or $5,681 for those with cerebral vascular disease; 10.7%, or $1,090 for those with coronary artery disease; and 73.7%, or $2,433 for those who became pregnant. Additionally, hospital admissions decreased by 39.4%, 21.2%, and 28.6% in patients with type 2 diabetes, cerebral vascular (stroke), and coronary artery (heart) disease, respectively. This new study involved more than 338,891 people over a five-year period (2005 to 2009) with both Highmark medical insurance and United Concordia dental coverage. All people had gum disease and one or more of following conditions: type 2 diabetes, cerebral vascular disease, coronary artery disease and/ or pregnancy. What this data reveals is that significant savings in medical costs are possible when patients with gum disease receive treatment. This round of findings is the result of looking at our data in a more refined statistical manner. Specifically, we accounted for the effect of diabetes on our stroke, heart disease, and pregnancy data. The goal was to make sure that, when we looked at people with multiple diseases, we accounted for the effect that diabetes may have on our findings. The new study builds on the results of an earlier study we did with our parent company Highmark and Marjorie Jeffcoat, professor and dean emeritus at the University of Pennsylvania School of Dental Medicine, which showed that treatment for gum disease is associated with significant decreases in the cost of medical care and hospitalizations for people with type 2 diabetes. What do the findings from these two studies mean for employers? The answer is significant savings and increased productivity. According to the 2011 Gallup-Healthways Well-Being Index, American workers miss 450 million days of work a year due to chronic conditions. That’s equal to $153 billion in lost worker productivity for today’s businesses. The new study’s findings demonstrate the importance of treating gum disease for people with chronic conditions or who are pregnant, showing that when people with gum disease are treated and maintained, significant medical savings are possible even when you look at people with multiple chronic diseases at the same time. Dr. Jeffcoat presented the latest study’s findings to more than 2,500 attendees at the American Association for Dental Research annual meeting this past March in Charlotte, N.C. Studies are ongoing and several other chronic conditions are being evaluated. To learn more about the studies and the connection between oral and health, visit www.UnitedConcordia.com. Dr. James Bramson is chief dental officer at United Concordia, a wellness company that administers dental benefits for more than seven million people nationwide. In this role, he directs the professional relations department, product development efforts, professional quality assurance activities, utilization review and claims review processes, and clinical aspects of communications. Dr. Bramson has 35 years of dental industry experience, including national experience as executive director of the American Dental Association (ADA) and secretary of the ADA Foundation. by Robert L. Heston, Jr.
We need to change the traditional definition of health from a focus only on diet and physical well-being only to a more comprehensive view in which it also includes peace of mind. Legal problems create a direct drain on an employee’s financial health, which is becoming an increasingly critical component of the employee health equation. Financial issues, which are the number one cause of stress, play a large role in the most preventable stress-related illnesses, according to the American Psychological Assn. LegalEASE has conducted extensive analysis of stress research and has identified the key manifestations of employee stress caused directly by legal problems, particularly unexpected legal problems. The analysis, which was released on May 1, also demonstrates the measurable costs of legal problems to the employer and the employee. There are many ways that employee legal and financial health directly affect a company’s bottom line. With today’s credit crunch, millions of Americans are just a lawsuit away from being wiped out of their financial position. A silent epidemic afflicts 30 million workers in the US — a quarter of the American workforce. This epidemic is costing businesses $15,000 per year per affected employee. When first reported in 1979, 10% of working adults said that they routinely experience personal financial difficulties; today that number is up to 25%. Financial stress is frequently listed as the top source of all the stress experienced by employees. The constant onslaught of economic gloom and doom is not only affecting people’s wallets, but also their psyches. As time goes on, people’s problems just fester and get worse, says Jill Wiedemann-West, a senior vice president and CEO of Hazelden, an addiction treatment center. How do these legal and financial problems manifest in lost employee productivity? To answer this critical question, we look at some important causes. • The underlying legal -problem, by itself, causes stress. • Employees may not be prepared to handle a legal emergency. • The ongoing, never-ending nature of many legal problems creates stress. • Employees are ill equipped to deal with the financial costs and -nuances of the U.S. legal system. Employees who are involved in legal problems suffer an enormous initial shock followed by fear of how this new problem will affect them. Picture a forklift-driver who is unexpectedly served with divorce papers at work. Imagine how distracted, fearful, angry, and upset that employee will become as the realization of imminent divorce settles in. Many questions arise: What will happen to my kids? What will I lose? What did I do wrong? Can I get back together? Where will I live? How will I make my current level of income? Where will all my savings go? How much will this cost? In truth, when a significant legal problem arises for an employee it is almost always unexpected; inevitably the employee is largely unprepared for handling the legal problem. Legal problems like divorce, child custody, nursing home injuries or abuse, criminal matters, and devastating injuries will almost always create enormous stress for employees. What is becoming more apparent is that a larger part of the employee population will face one of these stress-inducing problems. Many HR managers and companies fail to understand that some of the largest stressors from a legal problem are the anxiety, confusion, embarrassment, anger, withdrawal, and emotional upset that happen in the first few days or weeks of a legal matter arising. Over 70% of employees don’t know who can help them understand what to do. Once the realization of a lawsuit settles in, employees move very quickly from the initial questions of how will this lawsuit will affect me? to how and where do I find someone to help me? To their credit, many EAPs offer help in this area for employees in the limited form of offering consultations with lawyers to help employees assess their situation — to help them avoid that feeling of being alone. Employees often find this stage before they hire an attorney, but after the lawsuit notice to be the most stressful. An overlooked problem is that, while most employees have regular physicians, dentists, and even optometrists, most do not have relationships with attorneys. Out of desperation to find an attorney, employees typically end up following their peer or colleague recommendations to attorneys that were used in the past — even when those individuals may have had mixed results or had different types of cases with those attorneys. Employees make call after call to lawyers — some known, some recommended, and some gleaned from the online ads — to try to find one who can help. After days of calling and dead-end appointments, many employees stop trying to find the right lawyer and simply settle for any lawyer who will call them back. Most employees never get through to the attorneys and are forced to pick lawyers based on the phone call with the office manager or receptionist. Many dead-end appointments are made, which lead to missed work hours or even days. Employees face stress over the work they are missing, whether they will they lose their jobs, whether their employer will find out about the embarrassing legal problem, and what lawyer can affordably help. It is not uncommon for employees who take a do-it-yourself approach to take weeks to find the right attorney. Many never find the right one and settle for the one attorney who returned their calls. Until a lawyer is found and retained, stress can be higher then at any time during a lawsuit. Assuming that employees eventually retain an attorney and respond to the immediate legal problem, the questions change to how are they going to afford the lawyer and how do they get the information they need to understand the lawsuit and understand their options? Everyone knows that the American legal system is complicated and confusing and has created a number of procedures and systems that seem purely designed to increase the cost of participation. Many employees simply cannot get beyond the idea that, while they need to settle their legal matter quickly, neither the system nor the lawyers seems willing to do so. Trying to understand motions, continuances, rulings, unnecessary deadlines, and unfair extensions for the other party to respond can contribute to a substantial increase in stress from the legal problem compounded by the fear and unknown nature of the costs involved. The LegalEASE Employee Legal Health study shows clearly that the top seven legal matters cost employers a significant amount of money each year in measurable stress. These costs come in the form of absenteeism related to legal problems and finding attorneys, visits to doctors and mental health professionals to treat the sleepless nights and stress from legal problems, and increased costs of prescription drug to treat anxiety related to these legal problems. For every 100 employees, companies suffer annual losses of over $200,000 per year in the increased costs of just absenteeism, healthcare visits, and prescription drugs from the seven most common legal problems. This does not count the harder to measure presenteeism costs (an employee is present, but substantially deficient in productivity), or accident and injury costs from employees losing their concentration and accidentally causing damages or injury to themselves or others on the job. Even with a legal plan in place, stress will still plague employers and employees. However, a comprehensive worksite legal benefits plan can substantially reduce employers’ costs realized. This is especially true of plans that match employees to the right attorney and help shepherd the employee through resolution of the legal problem. Robert L. Heston, Jr. is president and CEO of the Legal Access Companies. He has more than 33 years of legal plan administration and law firm management experience all with the Legal Access Companies. Robert has grown the Legal Access Companies into one of the largest legal plan companies in the world with the most developed attorney provider network in the legal plan industry. Robert has been a speaker to human resources, attorney and insurance producer audiences advocating the benefits of quality in legal plans and has authored more than 10 articles for human resources and insurance producers on the connection between stress and legal and financial problems. Robert is licensed to practice law in California and Texas and holds an insurance license in all 50 states. He is also a Certified Health Insurance Specialist. For more information, email bob_heston@legalaccessplans.com, call 800-562-2929; ex. 3001, or visit www.legalaccessplans.com. When it comes to today’s diverse workforce, an employer must consider the needs of all its employees — from Baby Boomers to Generation Y. One way employers are addressing their needs is by leveraging voluntary benefits to create a universally appealing employee benefit package. Sixty-eight percent of employers say that one reason to offer voluntary benefits is to meet the diverse needs of employees, according to a recent MetLife study. However, voluntary benefits that appeal to Baby Boomers may not hold the same value for younger generations, so it is important to choose benefits that resonate with all age groups. Group legal plans can provide access to affordable legal services to meet the employee’s needs. One-third of all U.S. households considered hiring a lawyer on at least one occasion, but did not because of the expense involved, according to an American Bar Association study. Many people try to go it alone, which often results in increased stress and a disproportionate amount of time spent dealing with these issues. Sixty-one percent of employees who hired a group legal plan attorney spent less time at work worrying about and dealing with their legal situation. Eighty-six percent of Generation Y employees and 81% of younger Baby Boomers say they would value having benefits that meet their circumstances and needs, according to the study. • Generation Y (18 to 31): Common legal issues are dealing with debt management, traffic defense, and landlord negotiations. Two-thirds of recent bachelor’s degree recipients have outstanding student loans with an average debt of about $27,000. Carrying this level of debt can often lead to financial problems. A group legal plan covers many issues related to debt collection defense, including providing assistance in negotiations with creditors. • Generation X (32 to 47): Legal needs are most commonly focused around real estate and family matters. There are numerous legal issues involved in purchasing a home — from the home inspection to completing deeds and signing agreements for repairs. Lawyers can help with document review, contracts, and title searches during the home buying process. • Baby Boomers (48 to 66): Typical events that lead this group to seek legal assistance include tax audits, powers of attorney, living wills, and elder care. Many are caring for elderly parents and assisting with matters, such as Medicare, nursing home agreements, and other elder-care legal services. Most group legal plans include office consultations and document review for these and other issues related to aging parents. No matter what the employee’s age, many want more education about their benefits. In fact, 42% of employees surveyed are not confident that they use their benefits effectively. The desire for more education is highest among younger employees. Fifty-four percent of Generation Y employees said they need more help understanding how their benefits work and how they can help meet their needs. The study also asked employees how they want to learn about benefits. Seventy percent want to receive communications via their employer’s benefit website. The next most popular option is one-on-one in-person meetings. Providing a voluntary benefit, such as a group legal plan, which addresses a wide range of issues, can help employers achieve business goals in a cost-effective manner. A recent survey conducted by SourceMedia found that legal services have positive outcomes for organizations, including higher employee satisfaction, lower employee stress, and the ability to compete with other organizations for talent. This boost to employee loyalty is another finding of the MetLife study. Fifty percent of employees surveyed said receiving benefits is “an important reason I remain with my employer.” This is a significant increase from 38% the previous year. Sixty-five percent of those surveyed agreed that having customized benefits was a factor in their company loyalty. Legal services provided through the employee benefit program provide convenient access to experienced attorneys. This reduces time away from work, on-the-job presenteeism, and stress. Through a simple implementation process, a group legal plan can help a multi-generational workforce address personal issues quickly, affordably, and conveniently. Marcia Bowers is director of sales and marketing for Hyatt Legal Plans, a MetLife company. She has nearly 20 years of experience in the employee benefits business and has implemented group legal plans for hundreds of employers. She has conducted consumer research and developed thought leadership articles regarding the value of legal services for employers and employees alike. Bowers earned a JD from the University of Akron School of Law and belongs to the Cleveland Chapters of the American Advertising Federation and Sales and Marketing Executives. She is also on the Education Foundation board of directors for the AAF. With 1,600 sponsors, Hyatt Legal Plans is the market leader in group legal services and was recently awarded a Top 10 Call Center Award from BenchmarkPortal. Over the past two years, dental care has become more popular as a voluntary employee benefit. Employers are finding that offering it on a voluntary basis allows them to retain this prized benefit in the face of rising costs and shrinking budgets. Seventy-five percent of employees rate dental insurance as an important benefit, according to the Principal Financial Well-Being Index. As a voluntary benefit, employees usually bear most if not all the cost for dental insurance. At the same time, more companies are recognizing that good oral hygiene can reduce medical spending. Many illnesses manifest first in the mouth and dentists are the first to detect them, potentially lowering disability and medical costs. Cardiovascular disease, diabetes, and pre-term or low-weight births have been linked to chronic bacterial infections in the mouth. The need for voluntary dental benefits is clear. Fewer than six out of every 10 Americans had dental benefits in 2010, according to a report by the National Assn. of Dental Plans (NADP) and Delta Dental. The American Dental Assn. reports that three economic forces have created the perfect storm to reduce dental coverage among U.S. families: Nearly 13 million unemployed Americans lost their private insurance coverage since the start of the recession; fewer employers are providing dental benefits; and employers have reduced the scope of coverage or increased the amount workers pay for third-party private benefits, according to research by the Kaiser Family Foundation. Voluntary benefits are hot – especially dental plans. Individual and employer groups continue to purchase dental benefits, making them a core part of your benefit package presentation to your clients. The shift to employee cost sharing has become more evident over the past few years. In light of the Affordable Care Act, that trend definitely is getting more traction. As reported by Solstice, the percentage of enrollees making some financial contribution toward their coverage was 99% for discount plans, 93% for DHMO plans, 94% for DPPO plans, and 45% for dental indemnity plans. Adding workplace benefits to your practice is a great way to increase your revenue and secure more business. If you’re not doing it, someone else will. The workplace benefits market offers new opportunities for more revenue and better client service. Mark Roberts’ professional sales background includes 30 years of sales and marketing in the tax, insurance and investment markets. Mark is a licensed life, health and accident insurance agent in all 50 states and D.C., for insurance products and discount health plans. He serves as manager of National Accounts at Careington International Corporation (www.careington.com). Additionally, Mark works with clients needing insured products (www.careingtonbenefitsolutions.com) in the U.S. and discount dental and optical schemes in the UK (www.healthydiscounts.co.uk). Mark has been writing a health care blog for the past seven years, (www.yourbesthealthcare.blogspot.com). He also regularly contributes articles to magazines for both medical and dental topics both in the U.S. and the U.K. You can reach Mark at markr@careington.com. California brokers are well aware that the healthcare marketplace is still in transition. Along with healthcare reform and the Affordable Care Act (ACA) have come many changes, for both employers and employees. Today, your corporate clients are faced with having to share more costs with their employees, resulting in higher out-of-pocket expenses for workers who may already have trouble making ends meet. • The average price for inpatient hospital admissions rose 5.3% in 2011, outpacing the rate of inflation at 3.2%. When an insured individual is admitted to the hospital, hospital indemnity insurance pays a lump-sum benefit regardless of the cost of care. This benefit can be used to cover out-of-pocket expenses such as co-payments, co-insurance, deductibles or any other costs associated with hospitalization – or however the covered individual chooses. Clearly, hospital indemnity insurance is a needed and valuable product that gives employees an easy and affordable way to protect both their family and their finances. For employers, it contributes to an enhanced benefit program at no additional cost to them — a win-win situation for all in a challenging healthcare marketplace. Stacy Maloy is a senior -account executive for Unum. Employees are being asked to cost-share more of their health insurance in the face of rising healthcare costs and with the Affordable Care Act soon to change the landscape of the employer benefit arena. Meanwhile, employers are trying to soften the blow by enhancing other benefit offerings. At the same time, Baby Boomers are wondering if they’ll be financially prepared to retire. As it turns out, these circumstances are coming together to brew the perfect storm of opportunity for brokers selling long-term care (LTC) insurance in the group market. LTC insurance and other voluntary benefits have been experiencing an uptick in sales during the last couple years. This comes as employers are beefing up their buffet of benefit options to fill coverage gaps and maintain a benefit package that attracts and retains talented employees. Industry experts expect this trend to continue. In fact, according to MetLife’s 2013 Study of Employee Benefits Trends, 47% of employers are planning to add more voluntary benefits in the next two years. In particular, LTC insurance is well received in today’s worksite environment because of the advantages it offers to both employers and employees. LTC insurance serves as a much-needed safety net to help protect employees’ savings and retirement funds, given the high cost of long-term care and the high likelihood of needing it. According to the Dept. of Health and Human Services (HHS), more than 70% of Americans age 65 or better will need long-term care services at some point in their lives, and on average care will be required for three years. HHS pegs the average cost of a private room in a nursing home at $83,580 per year. What’s more, LTC insurance is proving to be of value for older and younger generations, alike. The Family Caregiver Alliance estimates that 40% of the 13 million people receiving long-term care are between the ages of 18 and 64. These statistics are starting to resonate with consumers as they overcome their denial about the potential need for long-term care and begin to prepare for reality. Current research shows that seven out of 10 working-age adults are concerned that they might need long-term care services in the future. As well, many Baby Boomers are caring for aging parents and, thus, are becoming increasingly likely to consider purchasing LTC insurance as a way to relieve their own children of bearing that same burden down the road. In addition to safeguarding employees’ savings, LTC insurance helps protect productivity in the workplace. Employers that offer this coverage to employees and their families are able to offset the potential costs that occur when employees become caregivers to a parent, spouse, or other family member. Employees who are pulling double-duty shifts as caregivers are likely to experience stress, distraction, or even a need to leave their job. For employers, this translates into decreased productivity and increased absenteeism, as well as facing possible retraining and replacement costs. An LTC insurance policy pays for someone other than the employee to provide care for the insured, allowing the employee to remain at optimal performance on the job. Many group LTC insurance cases offer simplified medical underwriting. This involves an abbreviated application with fewer health questions. In some cases, this can be a multi-life plan’s biggest advantage over an individual policy considering that many people who otherwise would be declined for LTC insurance coverage are able to qualify with simplified underwriting. Perhaps the biggest misconception about multi-life LTC insurance is that it is only relevant for large employer groups. The truth is that, with a minimum group size of just three, LTC insurance is a suitable benefit to present to companies of all sizes from the mom-and-pop shop down the street to your city’s largest employer. The versatility of LTC insurance plans for the group market gives you the options you need to structure the right plan for each of your worksite clients. Cases can be designed as employee-paid, employer-paid, or a combination of the two with each structure having its own nuances in terms of the availability of underwriting concessions, as well as costs and benefits to the employer. • Employee-paid – Most of the new business written in the LTC insurance group market these days is made up of voluntary plans, in which employees pay their own premiums. The plan is endorsed by the employer, allowing the broker to meet with employees about the coverage. Plans are offered to the employees at a group rate. Simplified underwriting can be made available to employee-paid cases when minimum enrollment requirements are met. • Employer-paid – Although less common in the current economy, some employers, such as those leading a family-operated business, pay LTC insurance premiums for their employees. The company may pick up the tab for the entire premium or pay a set percentage or dollar amount toward a policy with the employee expected to pay the remaining balance. Normally, employer-paid cases offer simplified underwriting. • Executive carve-out – A popular type of employer-paid case is an executive carve-out plan. With this structure, companies pay for LTC insurance for the business owners and select employees only. LTC insurance is a non-qualified employee benefit and, therefore, not subject to the Employee Retirement Income Security Act (ERISA) or employee discrimination rules. An employer can handpick from within the business whose policies will be paid by the company. Employer-paid policies are often used as part of an executive benefit package, as a retirement benefit or retention tool for key employees. In addition, voluntary coverage may be offered to the rank and file. There are significant potential tax advantages for employers and employees who choose to invest in LTC insurance coverage. Premiums for tax-qualified LTC insurance policies are eligible for federal and state tax deductions. Employees can treat premiums paid for LTC insurance for themselves, their spouse, parents or other tax dependents as a personal medical expense. For employers, the amount paid in tax-qualified LTC insurance premiums on behalf of their employees is tax deductible as a business expense. The tax advantages are multiplied for self-employed individuals and are the greatest for C corporations, which are entitled to deduct as a business expense 100% of the tax-qualified LTC insurance premiums paid on behalf of their employees, as well as their spouses and dependents. The deduction is not limited to age-based eligible premiums. Last but not least, if an employee or other insured should need long-term care services, the LTC insurance benefits received are non-taxable. A health savings account (HSA) is considered to be one of the most tax-favored savings vehicles available. As an account funded with pre-tax dollars and not subject to taxes at withdrawal, an HSA is an advantageous way to pay for qualified medical expenses, which can include LTC insurance premiums. Employees appreciate that employer-sponsored LTC insurance policies are completely portable. This ensures that, even after leaving the company or retiring, they can keep this valuable coverage by paying the premiums at the same rate. Group LTC insurance is the latest must-have employee benefit because of the abundance of advantages that it provides to employers and employees. It can’t be overlooked that this valuable coverage comes at little to no cost to the employer – just what your clients are seeking in the current worksite environment. The opportunity for brokers is enormous, and there is no better time than now to talk with your clients about LTC insurance. John Wane is the president of American Independent Marketing (AIM). With a 35-year history of focusing on retirement protection solutions, AIM’s product portfolio has grown to become one of the most complete in the industry, providing its agents access to multiple markets from a single source. In addition to carefully selecting the finest mainstream carrier solutions, AIM also has a successful track record of developing its own products designed to meet evolving consumer needs, including a critical illness linked-benefit product that covers long-term care. For more information, visit www.whyaim.com or call 800-672-7202. California has a reputation for launching trends that spread across the nation. As a physician and businessman, I’m always looking for innovative ideas that advance workplace wellness. So when I heard about a study of California employers’ wellness initiatives, I was eager to see the results. What I saw was that California not in the lead for once, at least in terms of the numbers. In surveys conducted by the Society for Human Resource Management (SHRM), 61% percent of California employers offer some type of wellness benefit or program to their employees. That’s significantly lower than the 72% of U.S. employers that offer wellness programs. Is California lagging behind? Let’s look further. When the SHRM survey asked how effective workplace wellness initiatives had been, 63% of the California employers offering wellness programs said the programs had helped reduce the costs of health care. And 76% said those programs had helped improve their employees’ physical health. So the bottom line in California is the same mixed bag I’ve seen in other parts of the country. Many employers are watching their wellness programs bear fruit for employees and employers. But other employers are dissatisfied with the wellness programs they have or they have none at all. I’m sure that all those employers care about their employees’ well-being. So for all of them, I’d recommend the same, California-approved approach: innovation. Whatever America’s workers have been doing to seek good health, it hasn’t been sufficient; the prevalence of obesity, diabetes, heart disease, and other chronic illnesses proves that. So it’s time to try new things. Health and wellness interventions have traditionally focused on promoting healthier behaviors one person at a time, often in highly isolated ways. It’s time to implement a social approach to health. Research conducted by ShapeUp and other groups has documented that people are more likely to achieve and sustain healthy behavior change when working with their peers. Hundreds of thousands of success stories can be told by employers who used peer coaching, friendly competition, and social accountability to help employees achieve their goals, improve their health, and enhance their well-being. A recent survey by the Towers Watson consulting firm asked employers how they encourage workers to take charge of their own wellness. Team or individual competitions were the most popular approach, used by more than half of employers. The other tactics that employers favored — from sponsoring healthy-recipe swaps to promoting mobile and online wellness apps — also made use of social networks and social media. A growing body of research shows that health assessments, screenings, and education, alone, will not move the needle appreciably on health improvement. To achieve gains in health and well-being, employers must motivate large groups of people to embrace behavior change. That’s a tall order, but it can start with simple steps. We advise employers to recruit influential, respected people within their workforce. Those peer leaders — often called “team captains” or “wellness champions” — can use corporate networks and social media to invite their colleagues to join them in healthy activities and behaviors. Wellness can be contagious, and the well-connected peer leaders in a workplace can help spread it. Wellness champion networks are rapidly going mainstream. A recent survey by the management consulting firm Aon Hewitt found that while 46% of employers have wellness champions, 83% anticipate having an active network within the next three to five years. There’s no doubt that well-designed games are addictive. Competition, teamwork, achievement, accumulation of rewards, earning status, new content, and personalized feedback loops can help people increase their exercise, improve their diet, lose weight, and prevent the onset of chronic disease. Because healthy behavior change is hard, most people quit along the way. Half the California institutions in the SHRM survey have instituted financial incentives to combat non-participation and attrition. But most financial incentives don’t take advantage of what we know about influencing behavior change. Traditional economic theory assumes that people usually make rational decisions. But behavioral economic theory explains that decisions are often irrational and impulsive choices shaped by biases the decision-makers aren’t even aware of. When employers understand these decision-making behaviors, they can design their program for maximum effect. For example, if an employee earned a $100 reward for participating in a wellness activity, many companies would fold that reward into a weekly paycheck or annual insurance premium. That may be easier for the payroll department, but research confirms that bundling masks the reward and diminishes its effect on behavior. Many employers ask employees to stay engaged all year in order to earn a reward at the end of the calendar year. This causes people to discount the reward, and its effect is lost. Similarly, some employers only offer rewards for achieving a distant outcome, such as reaching a healthy weight, rather than for the small successes along the way. These employers would get better results if they unbundled incentives, measured and rewarded not just outcomes, but also progress, and fulfilled rewards at the same moment that a participant achieves a desired goal or takes a step in the right direction. In the past, most corporate wellness programs have been web-based with no mobile access. If they offered employees help with tracking their wellness activities, they relied on old-school tracking devices such as pedometers. But today’s employees are using smartphones, mobile apps, and wearable, wireless devices in droves. More than half of all Americans use a smartphone, almost every one of those have downloaded a health-related mobile app, and tens of millions are buying wearable fitness devices every year. Wellness-related wearables include fitness bands and smart watches that not only count wearers’ steps, but also allow them to track sleep patterns, monitor heart rate through an optical sensor on the back of the device, and run a variety of health-related apps. If employers’ wellness programs are to stay relevant, they must keep pace with employees’ use of mobile and wearable technology, and apps and devices, such as RunKeeper, Fitbit, Bodymedia, and Fitlinxx. Employers are recognizing that good health is a total business issue and a lack of it affects workforce performance. Most now point to establishing a culture of health as their top priority and an essential factor for success, according to a recent Towers Watson study. That’s the final reform that I’d recommend to employers. It’s not really a separate innovation, but more of a perspective to take about all your wellness opportunities. Creating a culture of health in your workplace means ensuring that all the moving parts — social media, wellness champions, incentives, devices and more — are powered by the employer’s commitment to the well-being of its people. For innovators doing that important and exciting work, the sky is the limit. Dr. Rajiv Kumar is the founder and chief executive officer of ShapeUp, a venture-backed company that delivers social networking and gaming-based wellness programs to large employers and insurance companies. Under his leadership, ShapeUp now engages over one million participants across 128 countries. Dr. Kumar earned his medical degree from the Warren Alpert Medical School of Brown University and has focused his career on prevention, public health, and innovation in health care. He also received his Bachelor of Arts in Business Economics from Brown University. The fixed annuity marketplace is getting crowded. New entrants mean that seasoned and new advisors have a lot of information to review in order to make educated product recommendations. Brokers can develop a secure and long-term client base by developing a thorough understanding of the big picture of the annuities market — the sales process, what a purchaser is looking for, and the carrier’s integrity. Since the 2008 market downturn, there has been a shift in the way investors — particularly Baby Boomers — invest their retirement money. The average age of an annuity purchaser is 65 and getting younger. Life expectancies are on the rise, so workers will need more income to sustain them past retirement. This, coupled with risk aversion, has led to strong growth in fixed annuity sales. Fixed annuities are a great option for purchasers who want an investment that will provide a guaranteed rate of return. Workers nearing retirement age are at a life stage in which investment objectives and risk tolerance decrease. A fixed annuity can be a practical alternative for investors who don’t want to gamble with the money they’ve worked so hard to accumulate for retirement. Payout options for fixed annuities make them an attractive option for purchasers as well. A deferred annuity enables workers to accumulate savings — on a tax-deferred basis — until it’s distributed as a payment stream or a one-time, lump-sum payment. An immediate annuity guarantees payments, which start right away, for a specified time period or a lifetime. Whichever path a purchaser chooses, a fixed annuity offers the safety of that guaranteed minimum for those who are close to retiring and who are more conservative with their nest eggs. The bottom line is that most people buying fixed annuities are more concerned about the return of their principal balance than the return on it. Unlike bond funds or other types of equity-based products, the principal that is put into a fixed annuity is guaranteed at a minimum return if maintained for the life of the annuity. If an employee’s life savings is $250,000, their investment objectives are likely to be very conservative. The employee wants to purchase a product that guarantees that a stock market crash won’t reduce that $250,000 to $150,000 and send them back into the workforce. Finding an annuity carrier that is a good fit for brokers and their clients can be a challenge. New entrants that haven’t previously carried annuity products have increased the type and number of carriers to consider. Because of this, brokers have a lot of questions that must be answered before recommending a product. Which company will add value to the service you provide your customers? Will they help you stand apart from the competition? Is the carrier’s focus on short-term gains or a continued presence in the annuity marketplace for the long term? When determining which carrier to work with, consider these four things: long-term outlook, ratings, how funds are invested and the company’s assets. Consider carriers that have been around for decades or for even more than a century. Do they have a track record of successful, long-range investing for their customers? Today, a 65-year-old retiree can be expected to live at least another 20 years. Brokers and their customers need to know that the company will be available and be able to pay out benefits. A retiree’s main concern is that their assets will be available at retirement and even beyond for heirs. Make sure that the carrier’s outlook matches that of the customers’. Will the carrier be there to support that claim and help the retiree move forward, or sell the liability off to another carrier? In addition to longevity, the quality of a carrier is important. Working with a respected, high-quality company can eliminate default risk and guarantee income for purchasers when they need it the most. Financial strength ratings factor in a company’s investment portfolio, cash flow, earnings, and other internal and external factors. Ratings serve as an indication of a carrier’s vulnerability to unfavorable economic conditions and the ability to meet its financial commitments. Strong financial support is the basis of a fixed annuity. A strong reputation is one of the highest qualities in a carrier. Consider only the highest-rated companies that meet brokers’ and customers’ needs. This information can be found by contacting well-respected ratings agencies, such as A.M. Best, Moody’s, and Standard & Poor’s. It’s important to investigate a -carrier’s financial standing and history to confirm its strength and stability. Brokers should review the investment portfolio of carriers they’re considering for fixed annuities. Does the company invest in high-risk assets that don’t align with their customers’ needs? How do its investments or liabilities match up with fixed annuities? Although every carrier has to make investments to support its annuity responsibilities, investment portfolios can vary from company to company. Carriers that align investments and liabilities with those of fixed -annuities know that their policyholders don’t want to outlive their money. A financially strong and stable carrier is dedicated to meeting the long-term needs of its policyholders. Be sure that the fixed annuity you offer their customer comes from a carrier that has shown its stability through turbulent economic conditions, such as those we’ve had over the past decade. Although rate of return may be important to a broker, often it’s the opposite for a purchaser. Funding a comfortable retirement and leaving money to heirs are what the safety of a fixed annuity can offer. Brokers should focus on the features and benefits of a fixed annuity and align with a carrier that acts as they do—with integrity, personalized service, and customer satisfaction. Rich Lane is the director of individual annuity sales and marketing for Standard Insurance Company. He has been in the fixed annuities industry for more than 17 years. The Standard is a leading provider of financial products and services, including group and individual disability insurance, group life and accidental death and dismemberment insurance, group dental and vision insurance, absence management services, retirement plans products and services, individual annuities and investment advice. For more information on visit www.standard.com. Los Angeles Health Underwriters (LAAHU) held its annual University Day in Los Angeles at the end of April. 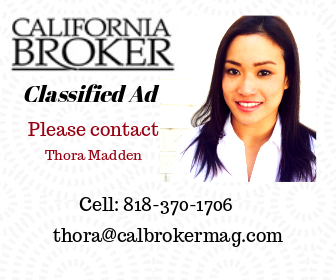 In past years, some feared that the Covered California exchange would make insurance agents obsolete. There was also the fear that carriers would struggle to meet the challenge of restructuring the entire health insurance industry. But this year’s event reveals that agents have certainly not become obsolete. In fact, they have gained new respect in Sacramento for their huge role in the success of Covered California. Certified insurance agents enrolled 39% of consumers; 41% of consumers self-enrolled through the Covered California website; and certified enrollment counselors and service center representatives each enrolled about 9%. But, as always, the industry still -faces political threats. Broyles noted that there will be an initiative on the November ballot to regulate health insurance sold to individuals and small employers. 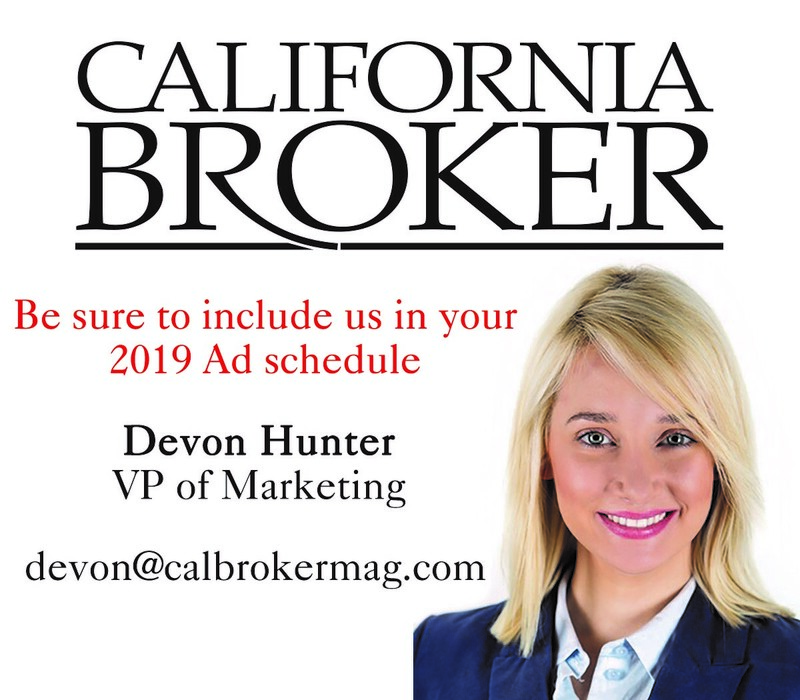 The initiative, which will receive an official number in July, would require the California Department of Insurance (CDI) to approve or disapprove all health insurance rate filings before they can be marketed to individuals and small employers. It would exempt large employers. It would encourage private parties to challenge applications by asking to review them, demanding additional information and administrative hearings, and even filing suit in Superior Court. Following the conference, Wakely released -findings that show the ballot measure would -conflict with the newly -reformed marketplace and would limit -consumer choice through Covered California. Wakely did the analysis on behalf of industry group, Californians Against Higher Health care Costs. Wakely says that the ballot initiative was modeled after a proposition that was approved in 1988. Proposition 103 authorizes the CDI to review and approve premiums for personal lines of auto, homeowner’s, and other property & casualty coverage. It also sets up a regulatory framework that includes private interveners, public hearings, and lawsuits. The problem is that California’s new health insurance marketplace differs markedly from the market for P&C coverage on which the ballot initiative is modeled. The health exchange is designed to manage competition among health plans. In this regard, the ballot initiative would be severely disruptive. Under prop. 103, regulatory reviews routinely take four months or more; and outside regulatory and court challenges could take an average of nearly one year to resolve — well past the window for open enrollment for Covered CA. Health plans would not be finalized and available for consumers until all regulatory review and outside challenges were resolved. Consumers would face a slow down or blocking of new benefits, new competitors, and additional plan choices. There could even be delays in the calculation of federal premium subsidies for the uninsured and for low and moderate-income consumers. The initiative would also undermine the transparency at the heart of Covered California by introducing considerable uncertainty into buying individual and small group coverage. These delays would cause chaos and confusion for consumers who would be unable to answer simple, yet fundamental questions about a health plan until long after they were required to purchase it according to the report. Broyles said that if the initiative were to pass, Governor Brown would probably not sign it. She noted that there is no love lost between the insurance commissioner and the governor. Allen Katz EVP, Sales & Marketing /chief sales officer at SeeChange Health said the ballot measure is an attempt at a “hostile takeover of our industry.” He said that if it is signed into law, “One elected official gets to decide how much a carrier can charge or offer. One official will decide how much you get paid.” The problem is that the insurance commissioner’s office is highly political. Every elected insurance commissioner has run for governor. So approving rate increases would make them look bad politically. Katz said that the industry is banding together to fight the measure. “Millions will be spent. Money has tremendous influence, but everyone has money now.” Katz says that it could be a popular ballot measure since, “No one doesn’t like beating up on insurance companies.” He urges agents to get the word out about how the measure could hurt consumers. “It will be won in the offices and homes of your clients. It will be your ability to go in and sell what the truth will be.” KPBS reports that a coalition of insurance companies has raised more than $25 million to defeat the ballot initiative while supporters have raised about $150,000. Martin Gallegos, a senior vice president of the Hospital Assn. of Southern California explained how the new market will bring “market merger mania.” Hospitals are looking to merge, and health care reform favors scale. Kaiser-like provider integration is another trend. He expects hospitals to do more post-acute care. Gallegos said that the ACA will bring about a shortage of PCPs. Legislation has been introduced to allow nurse practitioners to be PCPs. Gallegos also expects payment reform so that there will be no more $15 dollar aspirin tablets at the hospital. He also sees a movement toward value-based purchasing. “You will no longer be reimbursed for how much you do, but what you do.” There will be bundled rates so that doctors and hospitals must work together avoid duplicating services. Gallegos said that one concern is that many of hospitals are not included in the narrow networks of Covered California plans. That means that consumers are bound to end up in out-of-network hospitals for emergency procedures. However, he said, “We will see more hospitals coming into Covered California networks.” Also, legislators will start getting complaints as people buy into Silver and Bronze plans with high deductibles. Business owners are an attractive market for life insurance professionals. They provide many opportunities for insurance sales and the premiums can be significant. An often-overlooked opportunity to provide service and deliver value to business owners is in the area of business valuation. Historically, business valuations for clients and prospects were expensive and time consuming. That has changed; now innovative insurance agents see business valuation as an essential part of life insurance planning and sales — something that can set them apart from their competition. Fifty percent of all businesses are underinsured, and 40% don’t even have insurance. Why? It’s because, until now, businesses didn’t know what their companies were worth until after the underwriting process and only if they represented a very large premium to major carriers. In the past, if the carrier was not a valuation as part of a large underwriting process, the only way to get one was through a very expensive and time consuming process, making it highly unattainable for most private companies and small to midsize business owners. Now, with cloud-based valuation-as-a-service technologies, every business owner has an opportunity to know what their most important asset — their business — is worth. So what exactly does having a cloud-based, business valuation conducted in real-time have to do with insurance? Actually, it means everything. Business value is the number one determinant of how much insurance the business should carry. Business valuation is the trigger question and answer that will help ensure that the business and it’s key stakeholders have adequate life insurance, the proper umbrella policy, enough D&O and E&O; and the property and casualty coverage aligning to the asset value of their business. • Providing a valuation that establishes trust — You are offering an added service that will be useful to them. At the same time, you are establishing a basis for why you are recommending particular insurance packages. • Giving clients a more complete picture — Because so few business owners know exactly what their company is worth, it’s hard for them to know exactly what they themselves are worth. Maybe they have an estimate, but since it’s such an important part of their total worth, it behooves them to have a real number. Your clients want to feel secure. More than 75% of Americans believe that proper insurance brings peace of mind. Armed with a real-time valuation of their business, you can deliver the security that people want. • Providing an individualized solution — Today’s consumers are accustomed to tailored solutions. Because clients want to feel that you truly understand their circumstances, it’s important to provide an experience that makes them feel that you know what they need. By including a business valuation as part of your service, you are giving them something unique. • Establishing a road map for future sales — When you provide a business valuation, your clients can see, in real-time, where their business is now, and they can begin to imagine how it will grow in one, two, or five years. Along with growth comes a natural need for increased levels of insurance and financial security. As an insurance advisor, you are privy to people’s stories and their hopes for their future and for their children’s futures. When your clients have spent a lifetime building a business or carrying forth the family business, it’s imperative that this work be included and valued. Scott Gabehart is vice president of valuation support and services at Biz-Equity. As the author of “The Business Valuation Book,” he is one of the foremost experts in business valuation.